PSALMS 83:18 KJV "That [men] may know that thou, whose name alone [is] JEHOVAH, [art] the most high over all the earth." 15So persecute them with thy tempest, and make them afraid with thy storm. 16Fill their faces with shame; that they may seek thy name, O LORD. 17Let them be confounded and troubled for ever; yea, let them be put to shame, and perish: 18That men may know that thou, whose name alone is JEHOVAH, art the most high over all the earth. That men may knowe, that thou, whose name alone is IEHOVAH: art the most High ouer all the earth. that they may know that you alone, whose name is Yahweh, are the Most High over all the earth. For the Chief Musician. On an instrument of Gath. A Psalm by the sons of Korah. 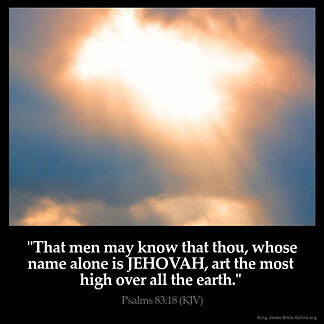 And they know that Thou -- (Thy name [is] Jehovah -- by Thyself,) [Art] the Most High over all the earth! (83:19) That they may know that it is Thou alone whose name is the LORD, the Most High over all the earth. Thanks always be to Jehovah, and our ONLY Savior Jesus Christ. Jesus is the only way to Jehovah. Peace be with you. Jehovah is my Lord and my God : I have come to know Him more and more every day : I sometimes groan within myself wanting more and more of my Lord and Savour .If my Lord gave me all of Him in a moment of time He would know that I would burst because I would not be able to comprehend all of who and what He is !!!!! I personally have fallen away and returned a few times because of stuff in my past. I have never lost sight of the " fact " that I can pray to my god Jehovah through his son Jesus for forgiveness and mercy.I feel it is very important to know which God that one prays to,after all, there is only one true god, Jehovah. Thanks. We are known by our names, not what we are man woman . God isn 't his name, it is what he is. His name is Jehovah. When you know someone personally, you call them by their name. If I am in a crowd and yell "Mom ", no one knows who I am talking about. However, if I call her by her name, then they know. People have many "Gods ", even devil worshippers have one Satan . If I pray to God, does anyone know which God I am praying to? If I pray to Jehovah, they know. I am a JW and I am and have been proud to call Him by His name. That is why we call ourselves witnesses we are witnesses of Jehovah Jehovah 's Witnesses . Glory be to Him the most High and all prayer through His son Christ Jesus. It is really nice to see others get to see that He does have a name, we go door to door like Jesus did, however no one wants to here us say His name.No debates just want to talk about the bible and how everything is inspired by Jehovah for reproving, setting things straight etc. 2 Tim 3:16,17. yay Jehovah is coming alive again! I am so happy that I have been able to read these comments. It is so wonderful to help others understand that Jehovah is the most loving and caring heavenly ruler who has ever given mankind the opportunity to live in a paradise forever. And he has chosen his beloved son to give his life for mankind. He is soon to bring about the end of all suffering and restore paradise on this beautiful planet! !